This is the first in a series of policy guides developed to support the implementation of the Asia-Pacific Information Superhighway (AP-IS). The objective of this policy guide is to strengthen the analytical capacity of government officials by using national statistics to identify the digital divide, effectively monitor Sustainable Development Goal (SDG) indicators that are related to information and communications technology (ICT), and adopt evidence-based ICT policymaking as part of the AP-IS initiative. 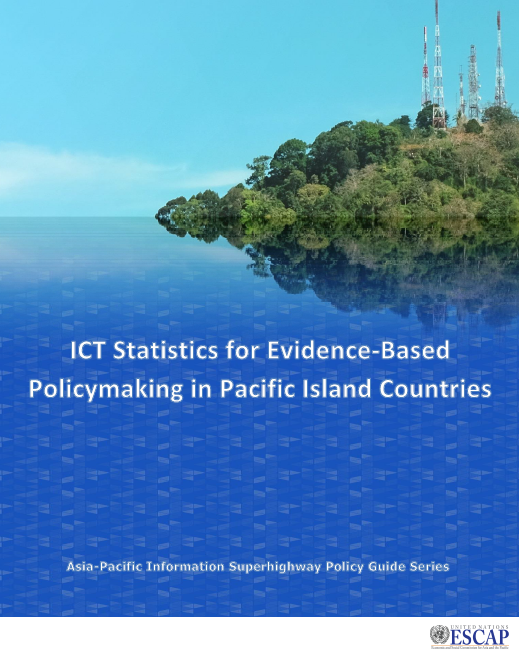 Timely collection and use of ICT statistics for evidence-based policymaking is critical for effective public policy. However, the availability and reporting of such statistics continue to be a challenge in most Pacific Island countries (PICs). But based on the ICT statistics available, they show that the Pacific subregion has limited access to affordable and resilient ICT connectivity. According to a study of the United Nations Economic and Social Commission for Asia and the Pacific (ESCAP), there were 18 ESCAP member States where less than 2 per cent of their populations had fixed-broadband subscriptions in 2016. Out of these 18 countries, 8 were PICs. In the case of mobile-broadband subscriptions in the same year, PICs represented 6 of 13 ESCAP member States with less than 20 per cent of their populations having access to mobile broadband. This policy guide raises key policy questions to highlight why ICT statistics are important for policymaking. It provides the status of key ICT statistics for SDGs in PICs, outlines potential sources of ICT statistics, and discusses the kinds of ICT statistics that can be sourced from national census survey data. Each section includes discussion questions that can be examined in groups or individually. The policy guide concludes by proposing key policy measures for consideration.